Cabo Verde, Pico do Fogo, Caldera. Volcano Pico do Fogo, 2829 m, the highest mountain of Cabo Verde standing isolated in the burned Lava fields. Hauses of igneous rocks in the Cha das Caldeiras. Bar in Mindelo's central square, Sao Vicente. We’re delighted to once again offer our guests the chance to explore the Cape Verde Archipelago, by embarking on a memorable cruise aboard the beautiful Harmony V Mega Yacht, complete with a range of optional excursions. Taking place during November and December 2019 and March 2020, this seven-night, eight-day cruise experience offers holidaymakers a wonderful opportunity to explore six of Cape Verde’s most diverse islands. An elegant and modern vessel boasting 25 luxury cabins (nine on the main deck and 16 on the upper deck), it’s time to take advantage of life on board; whether that’s soaking up the sunshine and views from the sundeck or sampling delicious cuisine in the dining room before retiring to the classy lounge. 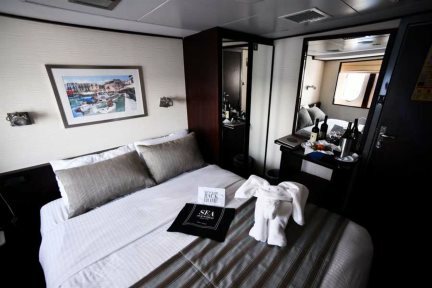 With an English-speaking cruise director and a maximum of 49 guests on board, this is a truly unique and memorable cruising experience. Day 1: Embark at Palmeira on Sal island at 4pm and enjoy dinner before departing for Boa Vista overnight. Day 2: After arriving early in the morning at Sal Rei, Boa Vista’s capital, you can relax upon some of the best beaches of the archipelago or take an all-day excursion to witness some of the island’s highlights and enjoy an authentic lunch at a local restaurant. 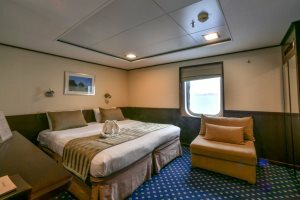 Sail overnight to Santiago. Day 3: Arrive at Praia, the capital of Cape Verde, and enjoy a morning of leisure with a tasty lunch on board. During the afternoon, opt to explore the history of the archipelago in the old capital and UNESCO World Heritage Site, Cidade Velha. Later in the evening, you’ll set sail for Fogo, the island of fire. Day 4: Today you’ll get the chance to explore the magnificent volcano on Fogo, also Cape Verde’s highest peak, during an optional excursion. Discover the lunar-like landscape created by lava from the volcano and visit the town of São Felipe to uncover its colonial Portuguese charm. Sail overnight to São Vicente. Day 5: Today you’ll have the opportunity to explore Cape Verde’s cultural heart; the city of Mindelo. With bustling cafés, lively restaurants and lots of live music to enjoy, you’ll get a real feel for life on the island. You can also embark on an optional walking excursion to visit galleries and restaurants, before overnighting in the port. Day 6: Today, set sail for Santo Antão, an incredibly beautiful island featuring vast green rugged mountains and hidden craters. An optional excursion will take you to explore valleys and rock formations, along with an opportunity to try grogue, the national alcoholic drink. Head back to the yacht for dinner and stay overnight in the port. Day 7: Today you can choose between two tours of the island; one full-day which showcases some of the island’s major highlights, including cliff-hanging villages in Ribeira Grande, the local fishing community in Ponta do Sol and a grogue distillery, among others. A half-day option includes a safari through volcanic landscapes and isolated villages, perfect for learning about life on this island, after which you’lldepart Santo Antão for Sal, spending the night at sea. Day 8: Disembark at Palmeira between 8 and 9am after a fulfilling breakfast on board. 7-night cruise that explores six of the 10 Cape Verde islands. Due to the travelling and nature of this holiday, child ages are restricted to children aged 7 and above. This cruise is designed as an add-on to a longer holiday in Cape Verde and pricing does not include flights. Double-bedded cabin, located on the main deck, with large windows. 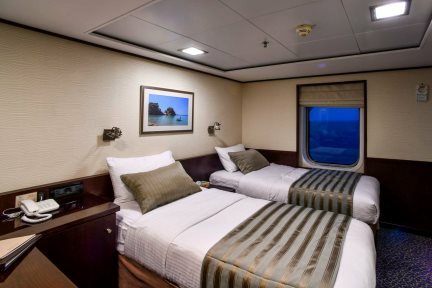 Double or twin-bedded cabin, located on the main deck, with large windows. 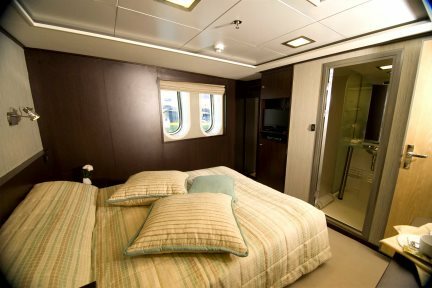 Double or twin-bedded cabin, located on the upper deck, with large windows.